The fact that local businesses can build brand awareness through local engagement and community involvement is both a luxury and a challenge. While many consumers happily support local businesses over out-of-town competitors, there’s also a heightened expectation for local businesses to participate in community events and connect with customers. Local businesses that keep a close eye on local news, events, and announcements have an advantage when it comes to building relationships with potential brand advocates, developing an online presence, and solidifying the business’s position as part of the local community. Put simply, keeping up with what’s happening locally is good business sense. 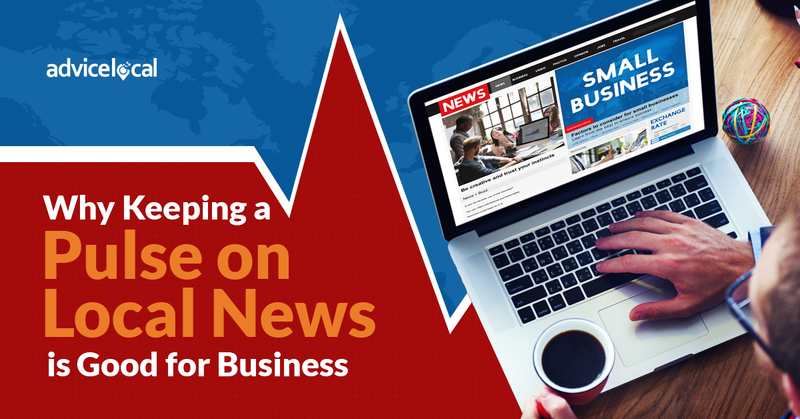 Local businesses can leverage their knowledge of local news to build stronger community ties and connect with consumers on a more personal level. It’s not just a matter of following along with local news, but actively participating in conversations – both online and in person – about local events, people, and businesses. Understanding the local community allows businesses to stand out from competitors and encourages brand advocates. Regional stories and local news can provide brands with creative local content marketing ideas. Whether a local story inspires an infographic or an upcoming event sparks a blog post idea, a local brand can draw plenty of inspiration from its newsfeed. Local content marketing can expand brand presence, drive more local customers to the business’s website, and generate new leads. Integrating local news into a brand’s social media strategy contributes to a well-rounded, authentic, and relatable online presence that both attracts local customers and reinforces the brand’s position within the community. Since consumers are more likely to share and comment on a social media post if it’s relevant to their friends and contacts, injecting some local flavor is an easy way to boost a business’s social media engagement. Keeping a pulse on regional events and announcements can also promote online visibility and improve local presence. That’s because awareness of upcoming festivals or tournaments gives businesses a chance to support the community through sponsorships, donations, or participation. Involvement in community events not only establishes good will, but can also create opportunities for local link building. For instance, sponsoring a local event or sports team often results in a credible backlink from the organization’s official website. Ready to start getting more involved locally? Check out BubbleLife.com and use the map to find your local community news.